Martyn Stanley has read 8 of 15 books. Martyn Stanley read 15 books of his goal of 5! Martyn Stanley read 16 books of his goal of 15! Martyn Stanley read 12 books of his goal of 10! Award winning writer, Martyn Stanley is married to his wife, Rachael, and has two young children. He lives in a small village and is a director at a small manufacturing unit. He has always been interested in writing, and over the years has spent many hours writing for pleasure on forums, as well as writing some short stories. "The Last Dragon Slayer" is his first novel, and his second and third books, “The Verkreath Horror” and "The Blood Queen" (along with other planned books), form part of the “Deathsworn Arc” series. He has also authored the 'Lambton Worm' and 'Return of the Worm Slayer' a re-telling of an old English folktale and a sequel. He has long been an avid reader of Terry Pratchett’s “Discworld,” and it was partly due to his love Award winning writer, Martyn Stanley is married to his wife, Rachael, and has two young children. He lives in a small village and is a director at a small manufacturing unit. He has always been interested in writing, and over the years has spent many hours writing for pleasure on forums, as well as writing some short stories. 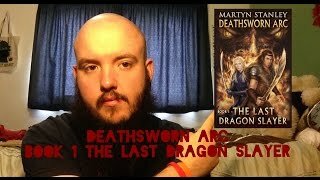 "The Last Dragon Slayer" is his first novel, and his second and third books, “The Verkreath Horror” and "The Blood Queen" (along with other planned books), form part of the “Deathsworn Arc” series. He has long been an avid reader of Terry Pratchett’s “Discworld,” and it was partly due to his love of this fantasy series, that he sought to write his own “epic fantasy” books. Unlike Terry Pratchett’s work, his books have a darker tone and address some adult themes, including questions of faith and moral philosophy. Martyn has many other varied interests. He is currently studying towards an Open University General Science degree, the course material of which has helped provide inspiration and ideas for his books. The course has also led him to read a number of other science-based books for pleasure, which has further strengthened his atheist leanings. Martyn is interested in video games and gaming culture, particularly fantasy adventure and role-playing games. He enjoys playing the guitar, and spent a few years in a rock band during his miss-spent youth! Besides this, he has an interest in martial arts, and although no longer practising, due to family commitments, he holds a second-degree black belt in Taekwondo. This is something he would like to resume doing, time permitting! Martyn won first prize for the DriveTribe 2017 Award for Best Article. To ask Martyn Stanley questions, please sign up. are you going to write more books in your DeathSworn arc? Martyn Stanley Thanks for the question! I have a full plot for the entire series scratched out in rough. The main villain of the series gets introduced late in book…moreThanks for the question! At that point we'll be about half way through the overall plot. I have titles for other books, I expect the finale to be called 'God Slayer'. For book 5 at the moment I imagine it will be either 'Emergence' or 'Mark of the Deathsworn' but I'm not sure yet. Martyn Stanley I've finished the draft of book 4 - main villain still not introduced... Maybe book 5? Martyn Stanley 1st 35,000 of book 5 is now being edited! More Deathsworn Arc coming soon! I don't get into town much these days. I spend most of my time in the quiet village I call home. Last night though I was in Newcastle-under-Lyme town centre to take my daughter to a LaserQuest birthday party. We’d love your help. Let us know what’s wrong with this preview of The Last Dragon Slayer by Martyn Stanley. Well, that's the second 'Witcher' book read! I really enjoyed it and whizzed through in a few days. However, it wasn't the perfect book. I wouldn't feel right giving it 5 stars. Before the review, the obligatory quick plug. Yes, I read fantasy. I als Well, that's the second 'Witcher' book read! I really enjoyed it and whizzed through in a few days. However, it wasn't the perfect book. I wouldn't feel right giving it 5 stars. Before the review, the obligatory quick plug. Yes, I read fantasy. I also write it. If you like fantasy, please check out my books. Most people who read them seem to really enjoy them. Right! On to the review. How was 'Blood of Elves'? Well, writing-wise, it was great. It reads kind of odd after having read A Clash of Kings. I think Martin and Sapkowski use distinctive, different narrative styles. If anything I'd say Sapkowski is a lighter, easier read. I really want to read this whole series. I played the Witcher 3: The Wild Hunt to death and fell in love with the characters. Not just Geralt, but Triss, Yennefer, Ciri and the huge side-cast as well. Getting really deep into the back stories of these characters is a joy. This book, as you might have guessed if you're a fan of the series is all about Ciri. The grandaughter of Calanthe - the Lion of Cintra. She's an orphan with a destiny. When we meet her in 'The Witcher 3' videogame she's a confident, young woman. An accomplished fighter and able to use her ability to effectively 'teleport' around the battlefield. That Ciri doesn't exist at this point in the timeline. Here she's a shy, young girl who Geralt has taken under his wing. As his ward, she's taken to Kaer Morhan to learn witcher skills with Lambard, Ezkel and Vesimer. Of course the witchers, though excellent at teaching her combat and agility - are utterly rubbish at bringing up a young girl. They also aren't able to cope with her special abilities. She's brimming over with untapped magical potential and they simply don't know how to deal with it. Triss turns up to address the situation. Why? Because Geralt asked her to. Why not Yennefer? Well, Geralt and Yennefer have a long, complex and tumultuous relationship which appears to be at a low-point during this book. Triss stays at Kaer Morhan and Ciri's situation starts to improve. Later, she's sent to the temple of Melittlele to learn with Nenneke. There, she's soon singled out as being 'different' even though she's presented as being an ordinary illegitimate child of a knight and a peasant. Yennefer arrives at the temple to try and unlock Ciri's potential. Frosty with each other at first, as they both begin to trust each other they form and enduring and special relationship. We begin to see why Ciri sees Yennefer as a mother figure in Witcher 3. She filled that role, in a way that I don't think Triss did. Geralt fights some monsters of course and there's a plot involving some villains trying to find Ciri. Phillipa Eilhart is in the book too, this being obviously prior to having her eyes gouged out by King Radovid in the Witcher 2 videogame. I think there was even a mention of Kiera Metz! Certainly the lodge of sorceresses is mentioned several times in this book. Part of the story takes place in Kaer Morhan, part in the Temple of Melittlele and part in Oxenfurt, where Dandelion and Phillipa Eilhart rudely interrupt a love-making session between Geralt and the medical student Shani who you meet in the 'Heart of Stone' expansion. All in all this is a great story. You meet all your favorite characters and you can appreciate how well CD Projekt Red did with capturing this series. The game blends almost seamlessly into the lore and the game characters are a glove-fit for the book characters. So why not 5 stars? Well, I bought this because I wanted a 'Witcher' book and this isn't quite that. Yes, Geralt features and has some escapades, but ultimately this book is far more about Ciri than Geralt. It's far more about the relationship between Ciri and Yennefer than any of the other characters. Geralt seems more like a background character for most of the book. That's fine, but it's not what I was expecting and I was disappointed not to read more of Geralt's adventures. If you're a fan of the books or the games, this is a great book though. It's more coherent than the first book and has a stronger narrative. You have to read The Last Wish to really appreciate this, but this is a more consistent book. The Last Wish read like a selection of short stories, some of which were weaker or stronger than the others. I'm reading American Gods now, but I hope to return to this series soon. Well, finally I finished this epic book! I found it thoroughly enjoyable. Before the full review though - the obligatory plug. Yes, I like reading fantasy. I also write fantasy. You can check out my titles on my author page if you're interested. Marty Well, finally I finished this epic book! I found it thoroughly enjoyable. Before the full review though - the obligatory plug. Yes, I like reading fantasy. I also write fantasy. You can check out my titles on my author page if you're interested. So, onto the review. What did I think of 'A Clash of Kings'? Well, like I said I enjoyed it. However, I find it a little bit weird reviewing this as a book. Because it doesn't actually read as a book. It reads as such a strict, unyielding continuation of the first book that it feels like you're actually reading the same book. Seriously. You could take your copy of A Game of Thrones and glue the back of it to the front of this book and just read it as one big book. In some respect 'Thrones' actually had a more prominent ending. Danaerys hatching her dragons felt like an iconic turning point in the story. The ending of this book however, Bran leaving Winterfell... Well, that just felt like a bit like a 'meh' moment. Like many people I actually came to 'Game of Thrones' through the HBO series. I'd actually recommend the series to most people if I'm honest. The books are great, and there's lore and plotlines you can only really appreciate through the greater detail of the books. However, there are certain things the series just does better. There are also quite a lot of bold differences between the series and the books. Watching the series is definitely a great way to enjoy the story without the massive investment of time needed to read the books. Though if you're a fast reader you might get through the books quicker than the series I suppose. There are too many differences to list in fact. Some of them small, like Tyrion actually being quite badass in the book version of the Battle of the Blackwater. Brienne of Tarth being, not just quite physical for a female warrior but also almost caricature ugly in the books. Then there's the bigger stuff. Like Reek and Theon being two separate people. I think there are other occasions whereby they've merged characters to make the story simpler and more cohesive. The whole section of Theon taking and losing Winterfell, I enjoyed more in the series. I thought the book over-complicated it. Arya's time at Harranhal was very different too. We got a much more detailed picture of Arya's life there in the books, like we got a much more vivid picture of her time evading the King's Guard in King's Landing in the first book. There's a lot of foreshadowing. On the downside we lose all that cup-bearing for Tywin Lannister. Instead she's cup-bearer for Roose Bolton! I also take big issues with the handling of Jaquen H'Gar. I'm sorry, but the series did him WAAAAAY better! In the book Arya does the same thing with her third name, but Jaquen's methods are explained in detail and they aren't particularly mystical or even impressive. It basically involves soup and releasing the the Northmen prisoners. In the series there's a real air of mystery about Jaquen and the way Arya and her friends leave Harranhal without really understanding how Jaquen killed all the guards. The mysterious worked much better for me. Reading the books does help you appreciate what the actors brought to the series. Maisie Williams really brings Arya to life and I can't imagine a better portrayal of this fascinating character. The boy who played Joffrey as well I think really brought the character to life. Book Joffrey is a nasty piece of work, but series Joffrey is just SO vile! So, series and book comparisons aside, how is it? Well, as I said - this is a very good book. But it reads as part of a much bigger book. If that was George R. Martin's intention he was very successful. His characters change as all good characters should, but their evolution comes across as sensible and natural. The tone is a very good fit and the books really do blend seamlessly together. All in all I really enjoyed this and I'm looking forward to starting the next one. I'd start it now, but there are other things I want to read and if I get too drawn into Song of Fire and Ice all the other great books will fall by the wayside. “The trouble was, love was such a strong emotion. It made everything else unimportant. It grabbed you and imprisoned you in the moment." “Enough Truthseeker! Do not utter another word about religion! We have debated it to death! If you so much as mention it again while I am present, I will resume my heart-carving. Not for the honour of Avanti, but to shut you up!" “Our lives are a flicker of light in the shadowy darkness of eternity. Disease, famine, war, death, sorrow... Life is a cycle of pain, perhaps the one thing we should do with our short lives is to try to leave the world a better place than we entered it?’"
Which of Martyn Stanley's first four Deathsworn Arc books is your favourite? "I do not 'like' the truth any more than you Avil, or anyone. I wrestled with it for a long time, for a while I was distraught, desperate to find that my research had been wrong - the more I searched, the deeper I delved the more clear it became that the truth was what it is. After much reflection, I came to the conclusion that though accepting the truth is hard, moving on from that, it becomes clear that the important thing is to make the world we live in a better place. We get one life, it's our duty to make the most of it." Erin wrote: "Thanks for the friend request." Leila wrote: "I too have to admit to collecting and loving all the original Arnie films about Conan Martyn. I still have them and still enjoy watching them now and again, without having to worry about suspending..."
Thanks Leila, I'll be honest I need a break from Conan. I ought to focus on reading my own books then getting book 5 and my subscriber exclusive prequel out. I'm really busy at the moment! Thanks for the kind offer of the Conan book. You should give them a go! The Red Nails story is really very good, the Black Seers one is too! I too have to admit to collecting and loving all the original Arnie films about Conan Martyn. I still have them and still enjoy watching them now and again, without having to worry about suspending belief about what they are, with any of the the faults they may have, or how Arnie steps up to the character he portrays. Quite simply, I'm a sucker for this type of film with any or all of the faults they may be reputed to have, without going into what might be wrong with them. So what! I love them all! Martyn I have a treasured rather large book on my shelves I bought in the late nineteen eighties I think for £20.00. It has 896 pages, is bound with leather (I think) and on the front in gold lettering it says 'Centenary Edition'at the top, then the title - 'The Complete Chronicles of Conan' Underneath the title is a sketch in gold of a helmet worn I presume by Conan and at the bottom the name of the author - Robert E. Howard. At the end of this huge tome is an afterword about the author and Conan by someone called Stephen Jones. This book contains all the stories you have described and many more. I wish I lived nearer to you for I would gladly gift it to you as I don't think I will be reading it now at this late stage in my life. I would gladly post it to you but it is pretty heavy! LOL. PS... I do have two paperback copies of book 1 of your series and book4 - 'The Rise of the Archmage' which is due to my inefficient system of buying books. If you don't have the actual paperbacks of these two books I would be happy to send them to you. Orient wrote: "Thank you for the friendvite :) Great that we share love for Pullman books :)"
Nicole wrote: "Thanks for the friend request, Martyn :)"
Tosh wrote: "Thanks for the invite, Martyn:)"
Natalie wrote: "I'm glad to hear your daughter likes Teen Titans. It was one of my favorite shows as a kid (still is in fact!)" She's actually seen all of Teen Titans season 1 and 2 now! Iv'e seen a lot with her. My favourite is the one with the retro games in it - that was brilliant. I think my favourite character is Raven. She's awesome! Anya wrote: "Thank you for the Friendvite, Martyn! I look forward to your thoughts on King's UR. I found it deliciously creepy. Hope you have a lovely day! ^.^"
Thanks Anya, I must admit I've had a bit of a 'King' hiatus. Once I've got my studies out of the way and I'm back into my reading I'll have to try another King! I read almost all of the early ones years ago, can't remember the last one I read - might have been Desperation? Thank you for the Friendvite, Martyn! I look forward to your thoughts on King's UR. I found it deliciously creepy. MLE wrote: "Thank you for asking." Destini Mia~ ♕ Sassy Lassie wrote: "Thanks for the invite, Martyn :)"
NP! Glad to hook up! I ought to try to get her some more episodes - she has the one with a villain called Billy Numerous in it!